RollinGreens has deep roots in the food business, Boulder and healthy, sustainable innovation. The name comes from the original organic food truck business in Boulder run by Co-Founder Ryan Cunningham’s parents in 1980. I met he and his wife, fellow Co-Founder Lindsey Cunningham at the recent natural products Expo West trade show and was impressed both by their product and their story – particularly how they have been able to work directly with farmers to bring a healthy, sustainable product to the market in a way that provides greater value for all involved in their supply-chain. They shared with me about their journey into becoming a challenger brand – and provided a window into the opportunities these kinds of brands can have for farmers. Tell me about your company — what are your products and why did you decide to launch a business? Lindsey: Ryan’s parents, JoAnn Saltzman (now Julianaa Satie) and William Cunningham started the organic food truck business in 1980. With three kids and one more on the way being Ryan, they retired the food truck and pursued other careers. In 2011, RollinGreens was reborn by Ryan and Lindsey. In 2011 we jumped into the food truck business and served the Boulder and Denver community. We had tremendous success catering weddings, events and became a staple at the Boulder farmer’s market. We wanted to create more scalability, and bring our innovative products to the marketplace. 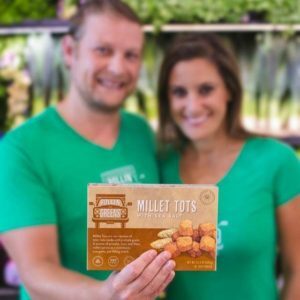 In May of 2015 we launched our packaged product line, with one of our top sellers from the food truck Millet Tots. Millet Tots are our version of a tater tot made with an organic ancient whole grain. They are gluten-free, vegan, a low glycemic index food and one of the most easily digestible grains in the world. Millet is also a sustainable crop, that requires little to no water to grow. We also realized that there was nothing like it on the market, and it was time for us to reach more consumers. Lindsey: We always say, we didn’t choose millet, millet chose us. Ryan grew up with millet on his dinner table and it was a recipe we perfected for the past six years. Ryan: Early on, we decided to focus on simple, clean and plant-based ingredients. We use whole foods with no binders or fillers. We source our millet from CleanDirt Farm, which is only two hours away, and we go out and visit them occasionally and are able to see the crop first-hand. Even from our food truck days, we always took the time to get to know our farmer and know where our food came from. We took the same philosophy into packaged goods. We appreciate what the farmers do for us, and want that to be passed down to the food they grow. It was our first year exhibiting there. Last year we walked the show and it was totally overwhelming. We left saying we will never exhibit. But, 3-4 months later, we decided we needed to do it. It was very expensive, but we bit the bullet. I can now honestly say that Expo West was one of the best things we could have done for our brand at this stage. We had such a great response on our product and new flavors, built up our fan base, and met with key retailers. Ryan: That was a huge part of our business – we decided to be a plant-based business early on in our career. Millet is a semi-arid growing crop so it takes less water to grow and it grows great here in Colorado which is where we are based. Creating products out of sustainable ingredients is the driving force for us. As we grow, we will be conscious of our carbon footprint. We plan to add processing plants near our grower’s and consumer locations which will enable us to minimize transportation impacts. Lindsey: On the employee side, it has been Ryan and I for the past six years. We recently took on a strategic partner to help us grow. You can learn more about the RollinGreens story on their website: http://rollingreens.com/our-story/ You can connect with RollinGreens on FaceBook and Twitter. The challenger brand food space is characterized by food brands that are re-defining the status quo for the category that they are in — occasionally creating their own category. 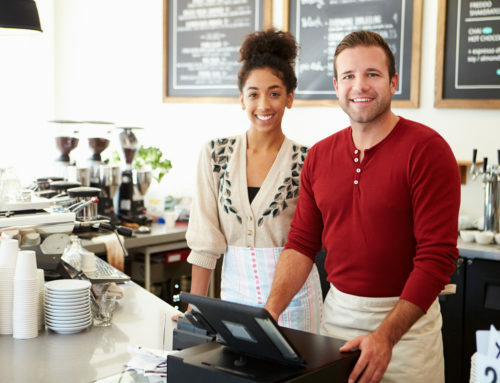 They are more than niche – they have found a pathway that is often more popular with today’s consumers. 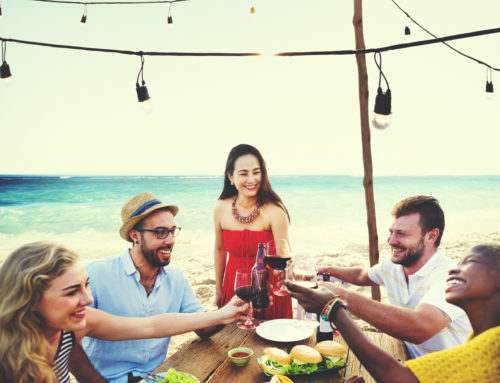 Characteristics of these brands include a focus on healthier ingredients, clean labels (meaning 5-7 ingredients that are recognizable as food vs containing preservative chemicals) and are connected to a purpose or mission that goes beyond profitability. At UpField Group, we always look for opportunities to elevate the voice of the farmer and we applaud RollinGreens for the value-added supply-chain opportunities they have created.